This year we have chosen a new location where for the first time an Iranian party is organized. The two different rooms, giving young and old space to dance and chill. The beautiful location with plenty of sitting space is available to us together to celebrate the Persian calendar year 1391. 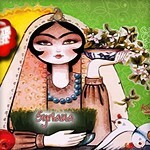 Nowruz marks the first day of spring and the beginning of the Iranian year. It is celebrated on the day of the astronomical vernal equinox, the start of spring in the northern hemisphere.